Update: source code is now available on GitHub. Today I would like to share a nice control which is part of my mysterious Windows Phone 7 app which will be released later this month. I call this control the PivotIndicator control. It can be used in order to show the user all the items in a PivotControl on a single screen, as shortcuts. A small rectangle (which use the phone’s accent color as background) is animated when the current pivot item changes. The user can press any item to immediately go to the associated pivot item. You can grab the source code here. 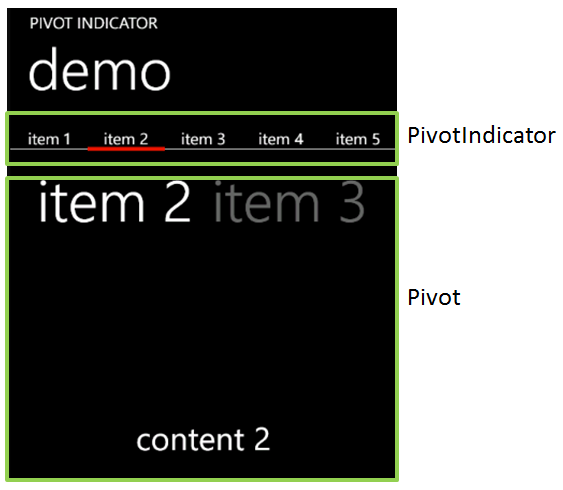 Adjust the layout of your page to be able to display the PivotIndicator. Typically this involves adding a row with a ‘*’ height. PivotRectange: this is a small control which contains a rectangle. The rectangle uses the phone’s accent color. Its position is animated based on the currently selected index. The coming week should be pretty interesting for any folks interested in Microsoft technologies. The Mobile World Congress will take place in Barcelona from Monday to Friday. Of course in the Windows Phone world, the next big step will be Apollo. Apollo is expected to be the next major version of the Windows Phone platform. At this point, we don’t know if Microsoft is going to talk about Apollo during MWC. Again, none of those information have been confirmed yet. We will see if MWC brings more answers. 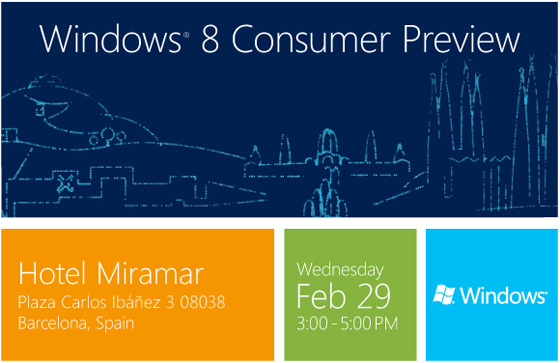 On wednesday 29th Microsoft will hold a special event in Barcelona for the release of Windows 8 Consumer Preview. The Consumer Preview will be available for download to anybody and should be feature complete. 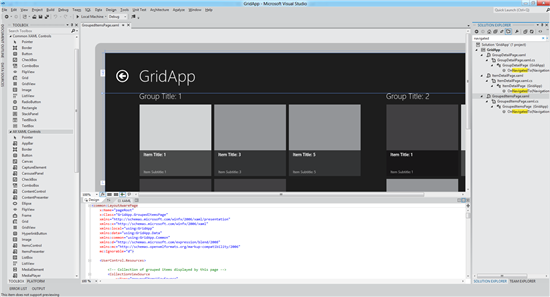 I’m expecting a lot from this release as the Developer Preview was quite incomplete regarding XAML development (for example Blend was only able to target HTML WinRT projects). With the release of Windows 8 Consumer Preview, Microsoft confirmed this week that we are also going to have access to Visual Studio 11. For more details, you can check out those posts: Introducing the new developer experience part 1 & part 2. Of course I’ll try to play with all those new toys as soon as possible. So you should expect more blog post this week ! In about 2 weeks now, I’ll have the chance to be part of the French TechDays in Paris as a speaker. 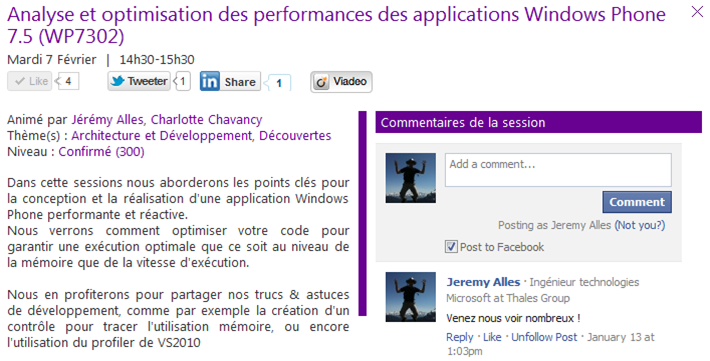 This year, I’ll own a session called “Windows Phone performance analysis & optimisation” with my colleague Charlotte. During the session we will use a “real” app we’re working on for a few months now (I’ll share more details after the session). We have some cool tips that haven’t been shared anywhere before, so if performance is a topic of interest for you, stat tuned ! I’m planning to share the most of the content of this session on my blog soon after the event.